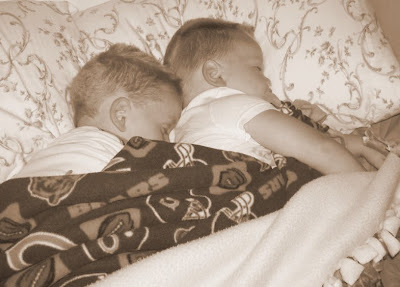 Cameron and Colin sleep right next to each other every night. 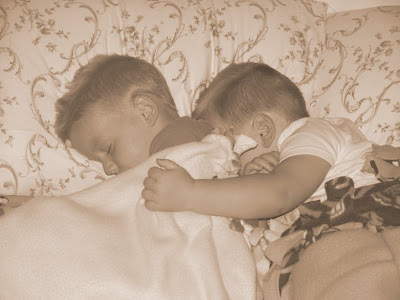 Shane built Colin's bed, and when Cameron got old enough, Shane built a trundle that would slide underneath Colin's bed every morning, but would pull out each night for Cameron to sleep on. (See a picture here.) I love it, for safety reasons. 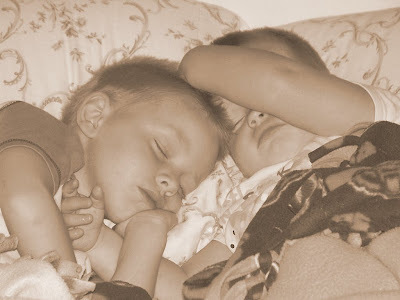 The boys love it because at 'rest' and at night, they are practically sleeping in the same bed--just different levels! "Colin, is that okay with you?" That is so precious, I love it! We are getting ready to move Caden and Carter together...I hope it is as sweet! I LOVE it!! Very sweet boys! These are precious!! :) What love!